Beauty or Beast? Or both perhaps? 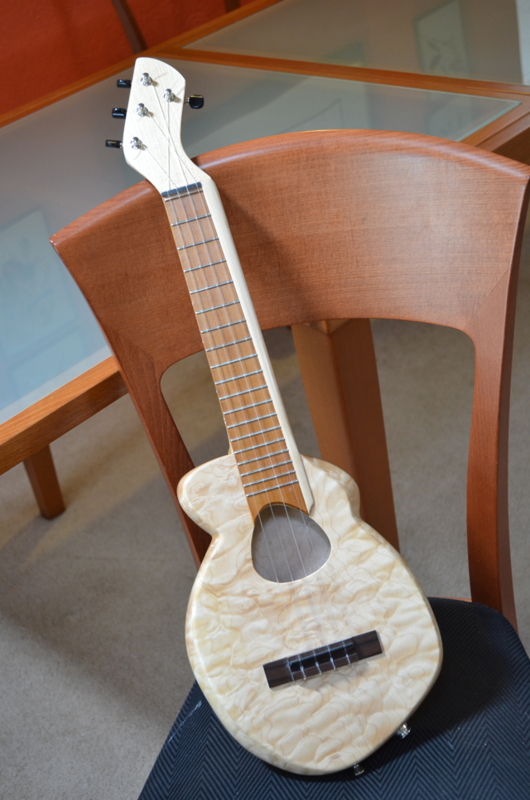 We’ve completed the “Mutant” ukulele to a point where we can string it up. It’s not entirely finished because we’ll be cutting on it and adjusting it for awhile, but it’s playable. Over the next few weeks we’ll be detailing the things we tried on this ukulele and discuss candidly whether they worked or not. Here are some images to get started. 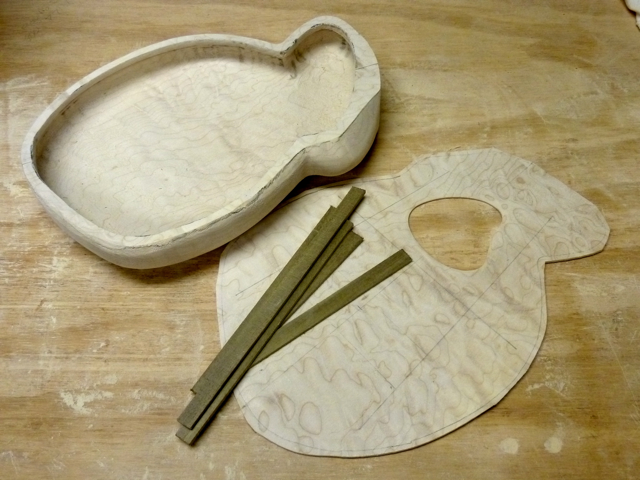 The body is a semi-hollow asymmetric carving. The most striking feature however has to be the wide bladed neck and crooked head. In hindsight, I should’ve shaped the bridge. The rectangular shape looks odd amongst all the swooping curves. 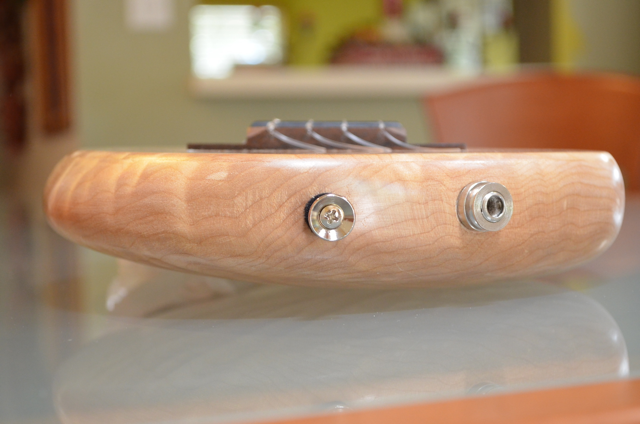 From the back, “The Mutant” is a quite striking with it’s quilted maple body. In this view, the wide neck is very odd-looking and the unusual arrangement of the tuners catches your eye as well. First impressions? It’s so weird, it’s actually a little difficult to evaluate. It is unlike any ukulele I’ve ever held. Personally, I like the way it looks, but public reaction has been… um… well, polite. Which gives me the notion that visually, it’s just too much for many people. It’s certainly not for the traditionalist. But it’s compelling. When people see it, they want to try it… particularly the fat neck. It’s incredibly comfortable to hold and play. This is standard for semi-hollows. At just 2 inches thick at it’s deepest, “The Mutant” snuggles right in close to your body. The body is shaped in nearly every plane and every direction. The body of “The Mutant” is shaped in a modified Manzer wedge (named for luthier Linda Manzer who makes gorgeous guitars up in Canada). It is deeper on the side closest to the floor (to the left in this image) which rotates the body and fretboard toward you when you play it. There are simply no sharp edges at all on the body. In the image immediately above, you can also see that the body curves dramatically along the top edge (to the right in the image) which gives your strumming arm a nice smooth place to rest. On a typical ukulele this would be a fairly sharp corner. 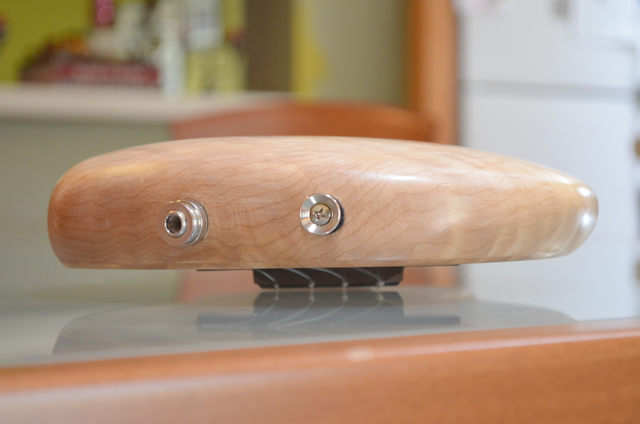 Some guitars bevel this edge but this is one smooth curve that is pure comfort to rest on. 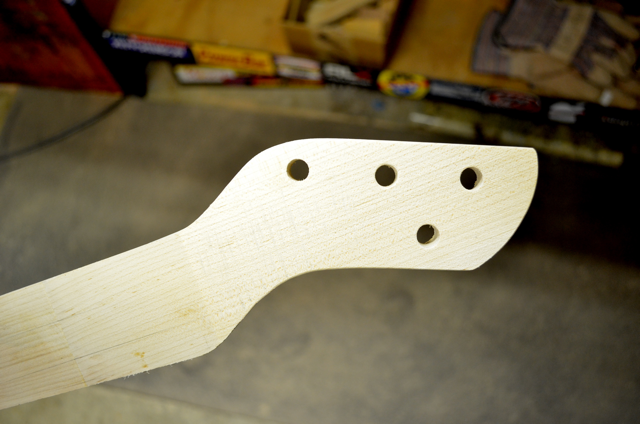 In this endview with the string-side up you can clearly see the curved edge where your strumming arm would rest. As I said, pure comfort. The crux of the discussion obviously is the unusual neck. The design is meant to open up your fretting hand a bit more as you pick and make chords. That is, we moved the strings away from the lower edge of the fretboard. The spacing of the strings is actually the same as on our other ukuleles but the neck itself is considerably wider. Does it work? Yes… well, kind of…it’s hard to say…maybe not…I don’t know. To be honest you’d have to try it for yourself. It definitely feels different. Whether that different is better, or worse or just different… you’d have to decide. I’ll bet you’d like to at least try it though. It’s kind of a cool feeling to make a chord on the first string and not have your finger bent so acutely. I think it would work for someone who only plays one ukulele. If this was your one and only it might work swimmingly, but if you were to switch off with standard neck ukuleles, I could see that being problematic. Since this is the key element of this experimental ukulele, I’ll go into it in more depth in another update. As well as discuss the odd shape of the head and unusual stringing pattern. Any thoughts on “The Mutant”? 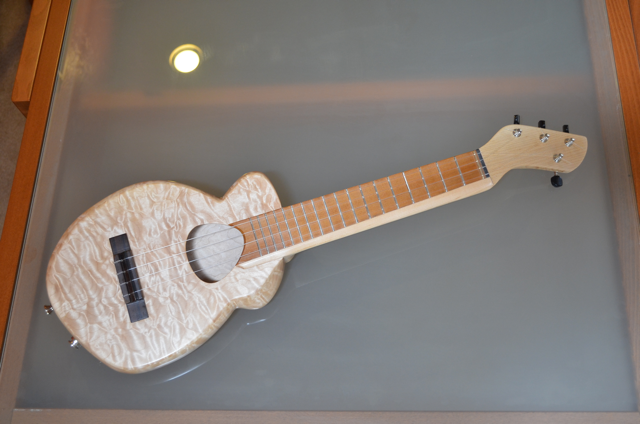 The “Mutant” ukulele is not so much an evolution as it is a alarming aberration. With its misshapen body and flat, twisted neck, its appearance is simultaneously horrifying and yet strangely compelling. It’s like a car accident… repulsive and yet you’re powerless to look away. Perhaps one day the “Mutant” ukulele will be recognized as a ground-breaking beauty, but for now his is a face only a mother could love. Despite all that, his potential is tremendous. Here are the first pictures of this developing horror. Buuahh Hah Ha! “The Mutant” ukulele. 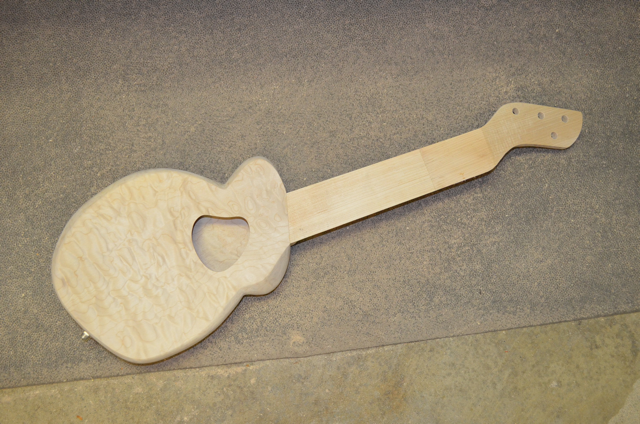 A semi-hollow HardBody, FatBottom, electric, tenor ukulele with an experimental bladed offset neck and asymmetric body. Say that fast twice! 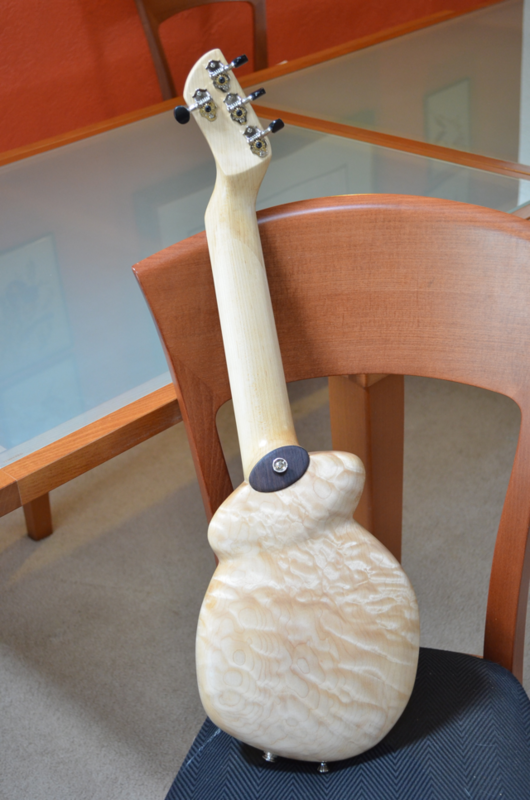 The “Mutant’s” body like out other HardBodies is carved from a single block of wood, in this case quilted Maple. 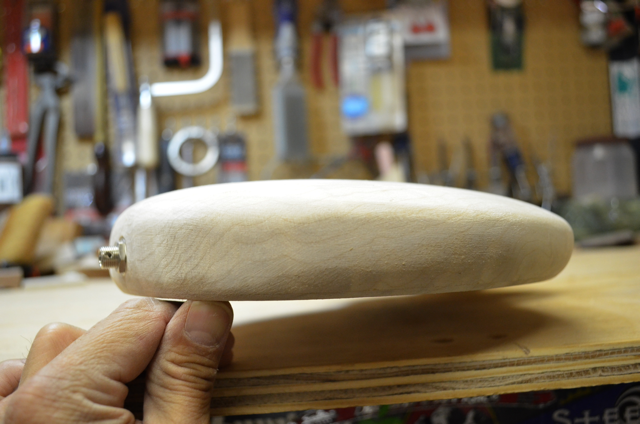 The sides appear to be very thick but they are deeply undercut. This end-view of the body shows how thin it is. The body is shaped in a Manzer wedge so it is deeper on the side closest to the floor. This give you a better view of the fretboard while you are playing. There are nothing but smooth soft curves resting against your body as you hold the “Mutant”. Barely 2″ deep, it sits very close to you as you play. You will definitely feel as one with this ukulele. 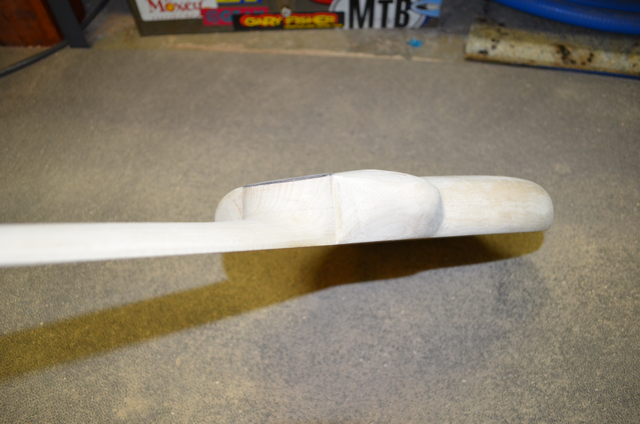 The shape of this body is simply not possible with bent wood… molded carbon fibre maybe but not bent wood. 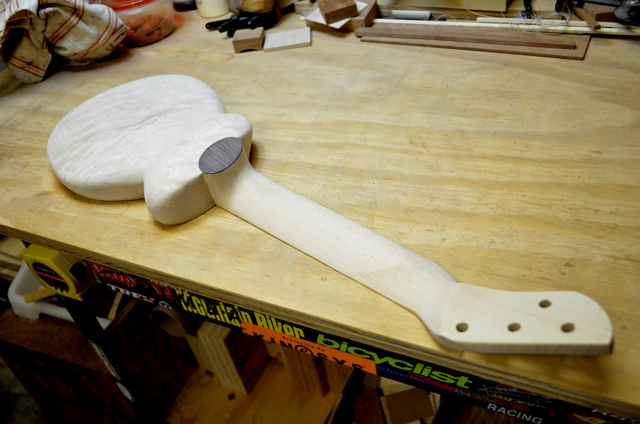 The Mutant’s neck i nearly 15mm wider than our standard neck so it requires this unique shape to provide full access to the first position frets. The bladed neck is very wide but quite shallow. It’s like a machete. Hey E! Bill did contact me thanks. Your comment got caught up in the piles of spam that I always get. Been very busy in the shop and now have some ukuleles in a retail store in Roseville.